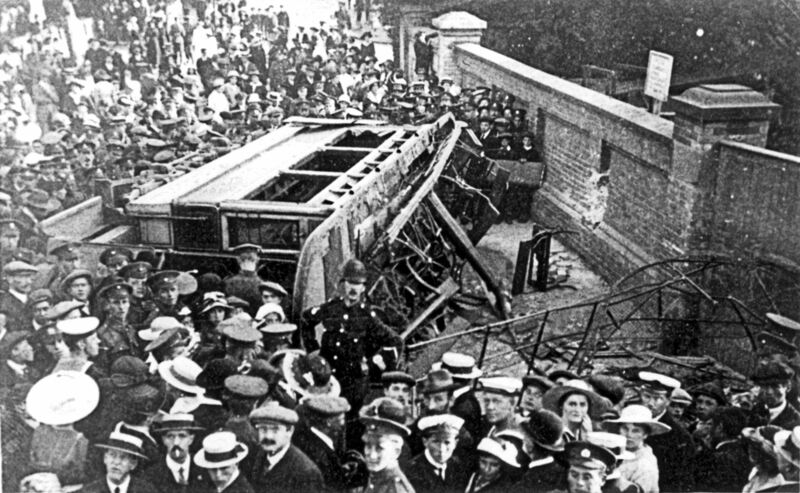 The Crabble tram accident of 1917 remains one of the worst on record with 11 dead and 60 injured (figures taken from the coroner’s report), many seriously. This is the story. Crabble is a hamlet in the village of River. The village is situated about two miles from Dover and is a combination of high hills with a deep valley through which the River Dour flows. The old A2 London Road is on the east side and up until 1977, when the Eastern Bypass opened, was the main road northward out of Dover. The western hills were once given over to farming and woodland but are now predominantly covered with housing estates. Alongside the river is the original village of River, a long straggling row of pretty cottages and meadows. There were once two paper mills, a corn mill, a seed mill and the Church dedicated to St. Peter and St. Paul. Crabble lies in a hollow at the southern end of the village. The hamlet, until the end of the 19th century contained a farm, Crabble corn mill and Crabble paper mill. There were, and still are, two road entrances into River from the London Road. The northern entrance leaves at Kearsney to the Alkham Valley, the first left turn is the road to River. The southern, and main access to River, leaves from Crabble Hill taking a sharp left turn into Crabble Road. The road then goes down a sharp incline, round a bend, under a railway bridge and curves to the valley bottom and the river Dour. On the right, at the time of the accident, was the Crabble Paper mill and opposite, abutting the north side of the river was Crabble House. After crossing the river, on the left is Crabble Avenue with the Cricketers pub on the left and on the right one of the entrances into the Crabble Athletic Ground. Crabble Road, after crossing the river goes up another incline and past, on the left, the main entrances into the Athletic Ground. Following a sharp right turn, these days is Lewisham Road that leads to the centre of River village and the church. 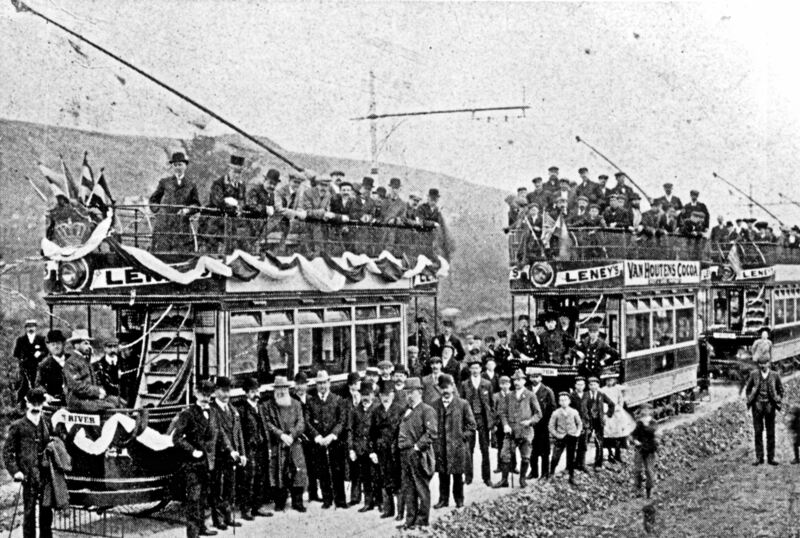 Electricity was first generated in Dover in 1894 and on 9 November 1895, the Corporation passed a resolution proposing an electric tramway. 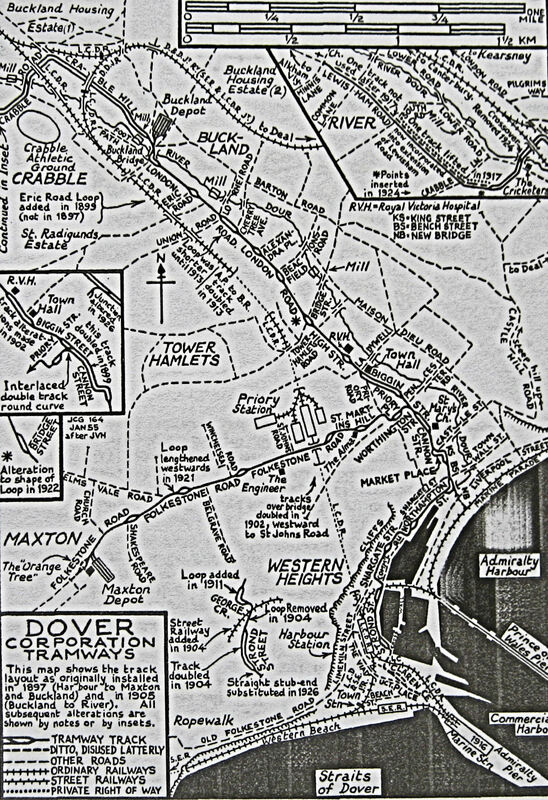 Authorisation was given through the Dover Corporation Tramway order of 1896, which was confirmed by the Tramways Orders Confirmation (no1) Act 1896. Costing £28,000 the first tramway was officially opened on 6 September 1897 and ran from Market Square. The 3 miles with 3foot 6inch (just over a metre) gauge track was laid within a year. All the trams were double-decker vehicles and up to 1926 had open top decks. Each tram was fitted with a primitive ‘cow-catcher’ type of lifeguard to prevent anyone falling under the front of the vehicle. The seats were slatted and were reversible by moving the backrest – one such seat can be seen at the Dover Transport Museum. In 1911, Sunday services were introduced. 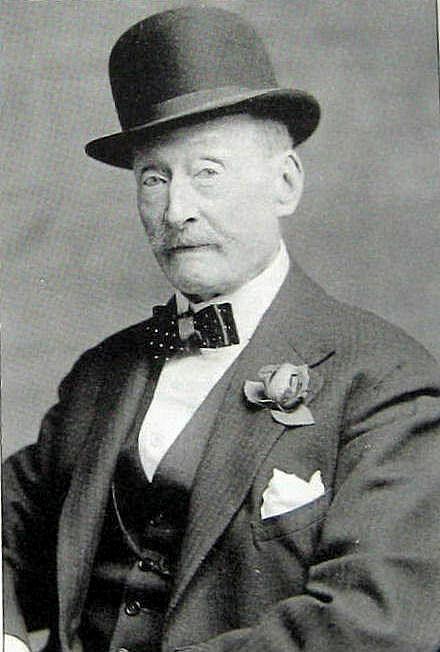 In January 1901, a private syndicate was formed headed by Sir William Crundall (1847-1934) and included Weetman Dickinson Pearson – 1st Viscount Cowdray (1856-1927), and John Jackson (1851-1919). At the time, all three were involved in the building of the Dover, St Margaret’s and Martin Mill Railway Line as well as the great Admiralty Harbour. 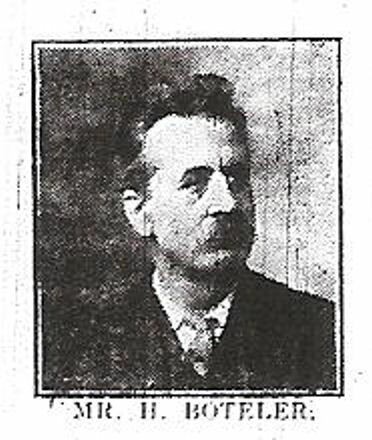 Crundall was also the Chairman of the Dover Harbour Board and of the privately owned Dover Electricity Company. He was heavily involved in local politics and was to be Mayor thirteen times. 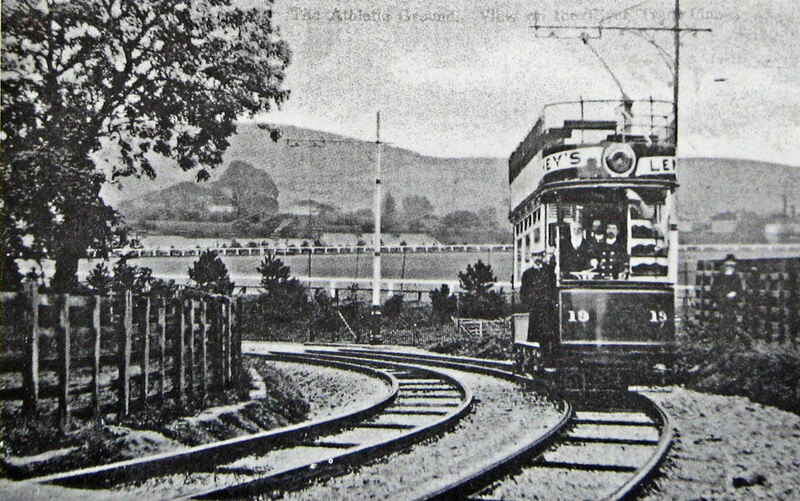 The syndicate proposed to build a tram/railway service powered by electricity, from the Dover-Deal railway line on Crabble Hill to River Church and then through to Kearsney Abbey and the Alkham Valley terminating about a quarter of a mile north of the road leading to Chilton Farm. Following an official inquiry in April 1902, permission was granted to build the tramway with the understanding that it was to terminate at Minnis Lane, River – close to the Church. It was agreed that the Company would lay down the track but that they could not exercise that power for two years. This was to give time for the council, if desirable, to obtain the authority to extend their tramways and include this track. Before finally being given the go-ahead, the tramway required the approval of the Board of Trade. Their report on the proposal made reference to the steep gradients and sharp curves. However, they were satisified as long as the outer rail on the upper curve of the down hill track on Crabble Road was super-elevated by an inch and a quarter. The lesser curve, near Crabble paper mill, was also to be super-elevated but by a lesser extent. These modifications were considered ample safeguard. The route was passed on 28 September 1905, by Colonel Sir John Wallace Pringle CB, FRGS (1863-1938), Chief Inspecting Officer of the Railways Inspectorate of the Ministry of Transport. The Dover and River Light Railway Order 1903 was granted on 12 October that year and named Sir William Crundall, Andrew Clark, George Clark and Robert Tritton, as the directors of the company. As the proposed track ran across a considerable number of private land there were delays due to the compensation claims being unexpectedly large. 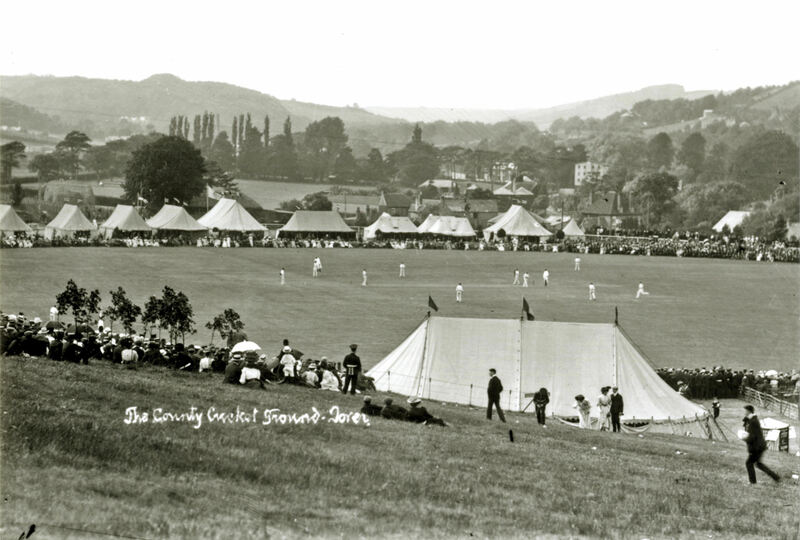 In 1904, Crabble Athletic Ground opened but it was a time of high unemployment and by autumn, it was necessary for the council to provide relief works. On 11 October that year, Councillor Wright proposed to invoke the 1902 provision and used the unemployed to build an extension track for trams to River. Building the double-track tramway involved overcoming several major obstacles, the main ones being the gradients and curves. Crabble Road is steep – 1in10 – with a 135º bend before the track passed under the low bridge that carried the then London, Chatham and Dover railway line. After which, there is the second curve on the incline. 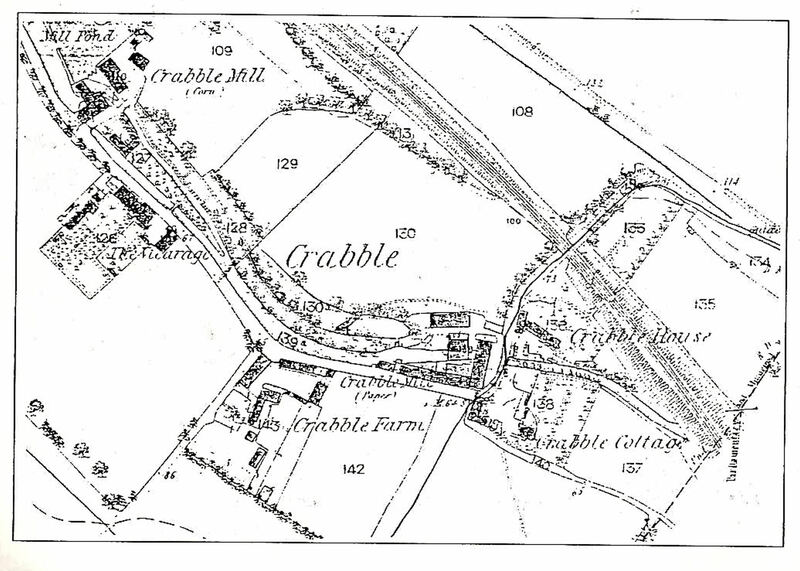 Following the laying of the track, another Board of Trade inspection recommended that the curves on Crabble Road should be increased in radius and the gradient modified. It was estimated that this would cost £21,000 but was not introduced, possibly due to the cost. Because of the terrain, after the railway bridge it was found to be easier to erect the poles carrying the overhead cables on the ‘wrong-side’ of the road. This caused the trolley-booms to trail across the top of the cars. From the tram shed at the bottom of Crabble Hill, on London Road, to the 90º turn for River the track was on wood block. At the start of the turning into Crabble Road, the track was on a sett paving that continued until it reached the north gate of the Athletic Ground. From there were open fields until the village of River was reached. After the track crossed the Dour river bridge on Crabble Road, there was the incline past the Athletic Ground and then fields. It was decided to lay the track on sleepers, with chalk and clinker ballast, through a narrow cutting to lessen the gradient. Before reaching the top of the hill a long gentle curve was started for what became a 45º right turn. Still on sleepers and ballast the track followed a contour, level with River Church roof, behind the River workhouse to a terminus in Minnis Lane. This part of the track eventually became Lewisham Road. On reaching the made-up road behind the workhouse the track was bedded on wooden blocks. From the curve to the made-up road, much of it was fenced with several crossing gates for cattle. The British Electric Equipment Company tender of £10,353 2shillings 8pence, won the contract for the building of the River extension and work started on 20 February 1905. On 2 October 1905 Dover’s Member of Parliament (1889-1913), George Wyndham (1863-1913) opened the track, travelling in Car No21. Car Nos.18, 19 and 20 carrying dignitaries, followed. World War I (1914-1918) for Britain started on 4 August 1914 and it was generally accepted that it was the duty of every man, who was of military age, to do his duty and fight for the country. It was not until 1917 that the Ministry of War issued a directive stating that experienced tram drivers were exempt from being called up. Up until that time, another directive stipulated that tram driver vacancies should be filled by soldiers who had been discharged from the Army on medical grounds. This was regardless whether they were experienced tram drivers or not. In August 1917, it was reported that 70 experienced tram drivers had left the Dover service since the outbreak of war. The council coffers had gained by the use of inexperienced drivers as they were paid less. Indeed, in 1915 they were delighted to report that the Tramways undertaking, owing to the great increase of population and the fall of expenditure, had a most profitable year. Further, as the accidents had been negligible, the amount paid in insurance premiums had reduced. In 1917, the annual premium was £200 and this provided coverage, in case of accidents, of up to £1,000. The driver of the No 20 tram on the afternoon of Sunday 19 August 1917 was one such recruit. 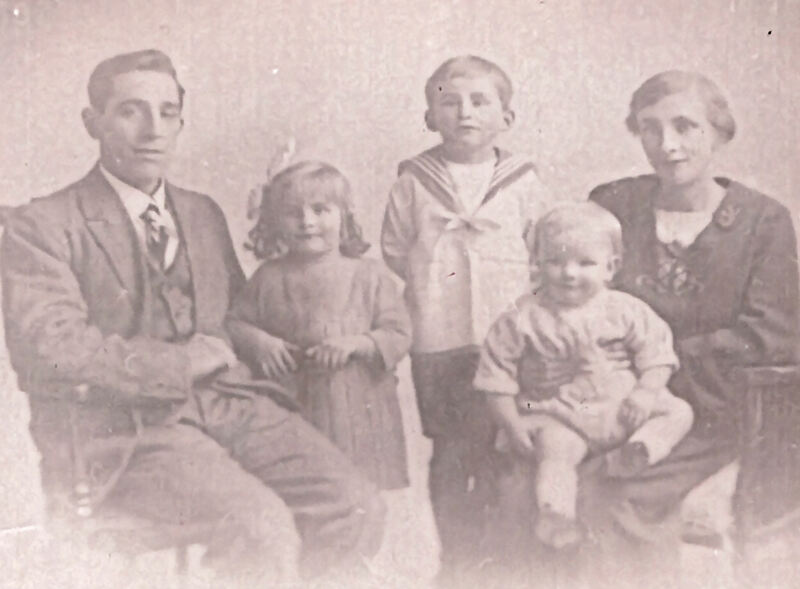 Albert James Bissenden, who was born on 12 August 1888 at 5 Granville Terrace, Charlton and married Mable Minnie Reeves on 12 December 1915 in Saint Bartholomew’s parish. Bissenden volunteered at the outbreak of World War I and became a private in the Army ordnance corps, based in Colchester. Bissenden was sent to Egypt where he examined explosives but at the end of 1916, due to heat and pressure of his work, Bissenden suffered a nervous breakdown and was discharged on 22 February 1917. Following his return to England, Bissenden made a rapid and complete recovery. Five weeks before the accident he started work as a tram driver having never driven a tram before. 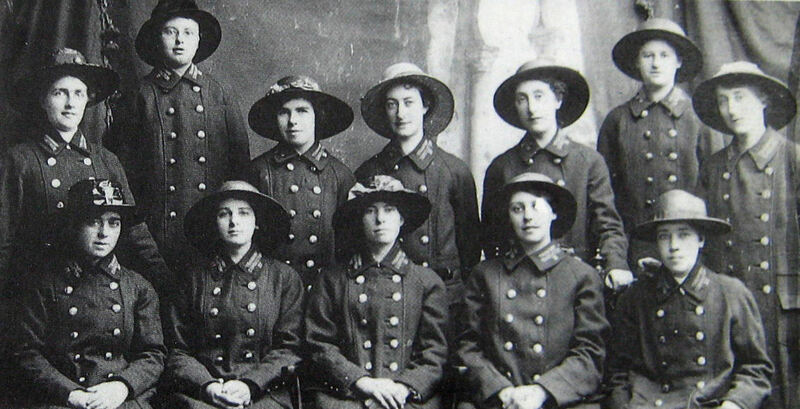 Conductress Lottie Scrase is in the centre of the front row. Bissenden proved to be quick learner, within two weeks he had passed the in-house test and was in charge of driving a tram. It was well recognised that only drivers with considerable experience drove trams on the River route but due to the shortage of experienced drives, that Sunday was the fourth day in a row that he had covered the route. The conductress was the experienced Charlotte (Lottie) Scrase, who was adept at handling passenger-related problems. She had changed shifts that day in order to be free the following weekend as she was getting married. 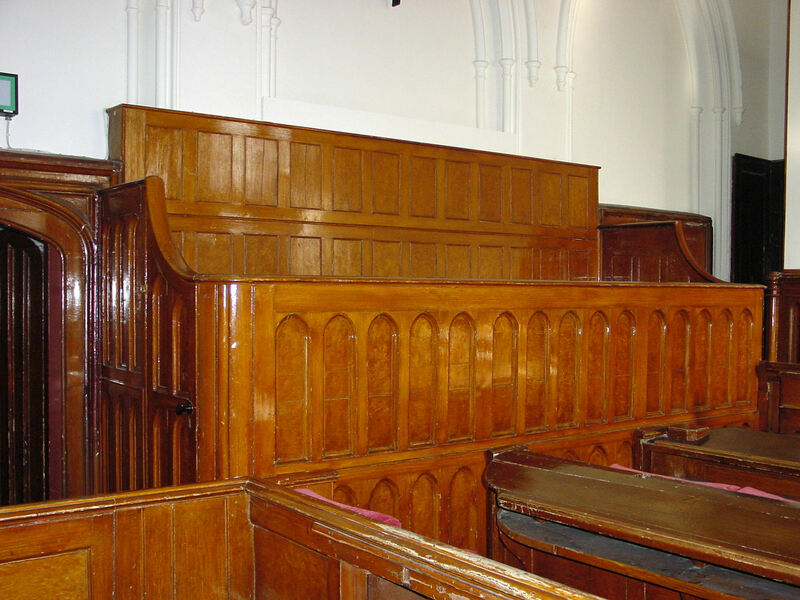 At St Bartholomew’s Church in the High Street, women’s suffrage campaigner, Lorna Bomford climbed on board No20 and found a seat on the inside. By the time the tram had reached Buckland Mill, at the bottom of Crabble Hill, Miss Bomford later testified that the tram was so full that people were standing in the doorway and on the step. Lottie told driver Brissenden that the vehicle was full and that there was no room for any more. She then went upstairs but as it was so full and folk were standing, she did not come down. It was probably because the tram was so full that Bissenden drove past the next stop, where potential passengers were waiting. On reaching the brow of Crabble Hill, before traversing Crabble Road, it was usual for drivers to stop and turn the control key to the off position in order to cut the power supply. This automatically slowed the trams down and because the main brakes were rheostatic – electrical braking using a load resistance – they could only be applied if the power was cut off. For whatever reason that Sunday, on that run, Bissenden did not stop and turn off the control key. This meant that the tram was on full power from the top of the incline. Bissenden, as usual, applied the Spencer slipper track block brake on the first bend but instead of slowing down the tram gained momentum. Realising that it was going too fast Bissenden tried to apply the emergency brake but this did not work as the power was still on. Probably a combination of panic and inexperience, Bissenden failed to realise this. Instead, he tried the slipper brakes that was operated by a wheel and pressed on the running rails, but under the circumstances were of little use. The tram was by now careering down the hill and Bissenden tried the hand brake but it seemed to be jammed. On board was an off-duty soldier, Trooper Gunner, who tried to stop the tram using his feet as emergency brakes. Before the tram hit the Dour bridge wall, Bissenden had jumped free. The tram overturned at the bottom of the second bend on Crabble Road and the upper deck smashed into the wall. Eleven people were killed and 51 civilians plus 9 military personnel were injured. 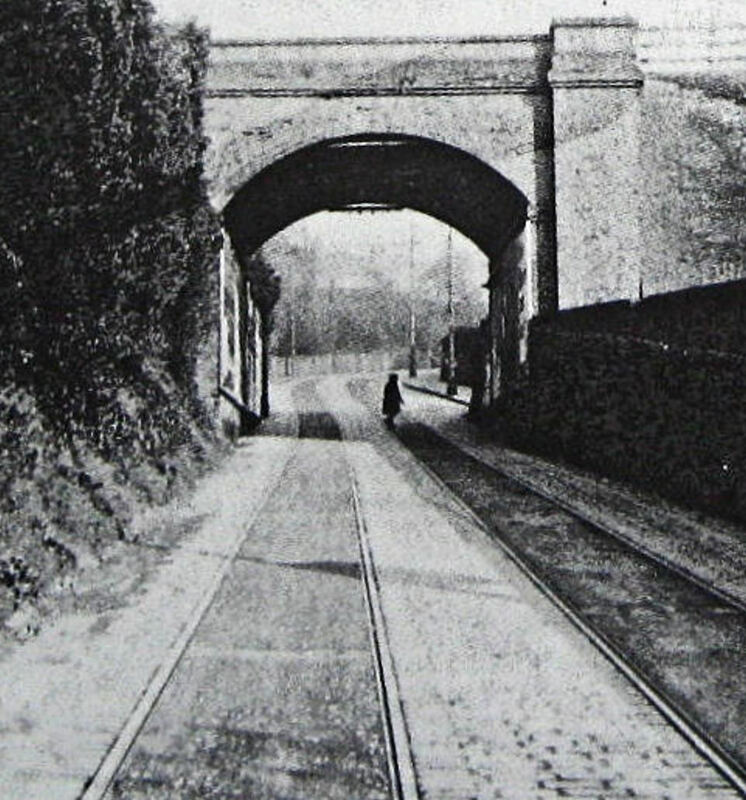 At the time, a train was crossing the railway bridge on Crabble Road. The driver stopped at the Bunkers Hill signal box and reported the accident. There, the signalman went to the house next door and the lady occupant ran down the hill with the intention of going to the tram shed at the bottom of Crabble Hill to tell them of the accident. On her way, she met Inspector Elgar of Dover police force who went instead. At about the same time Police Constable Booth was passing the scene of the accident. He immediately went to Crabble Paper mill and telephoned the police station. Inspector Elgar, on finding that the police station had been informed, boarded the next tram to River and on reaching the top of the slope disembarked the passengers and then took the tram down Crabble Road. Although, medical aid had not yet arrived, P.C. Booth was applying tourniquets and had organised locals tear up sheets for bandages. 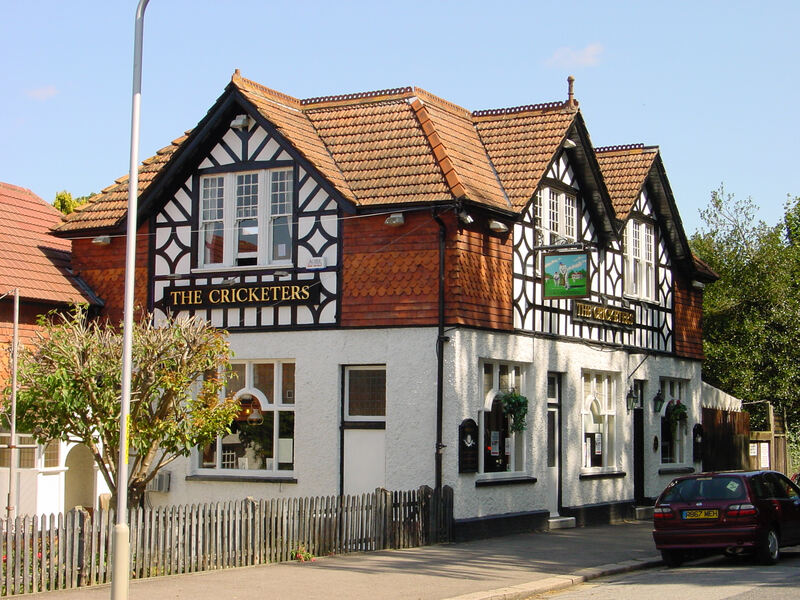 He had also arranged for others to carry the dead to a nearby shed or the Cricketers pub. The badly injured were being moved into the shade or into a house nearby. Inspector Elgar organised the most severely injured to be taken to the Royal Victoria Hospital (RVH) in the High Street on the commandeered tram. Two of the victims died on the way. All the injured were initially taken to the RVH and from there the military personnel were taken to the Military Hospital on Western Heights. Six people had died instantly, three more on the way to the RVH. All the dead except Lieutenant Roberts passed away after admission into the hospital. The Market Hall was used as a mortuary. Lieut. Roberts died at 19.45hrs the following day from a fracture of the skull at his home 46 Denby Road, Belgravia. Trooper Gunner lost both his feet in consequence of his actions. 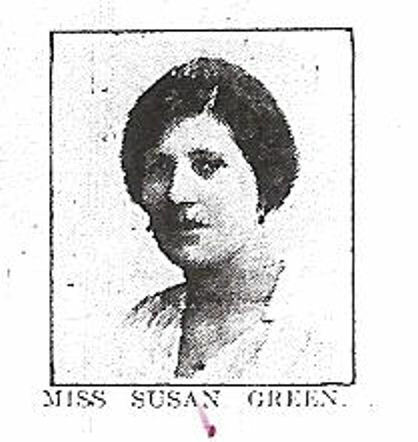 Susan Green – age 29, 4 Norman Street, employed in the Army Records Office, fiancée of George Foster. 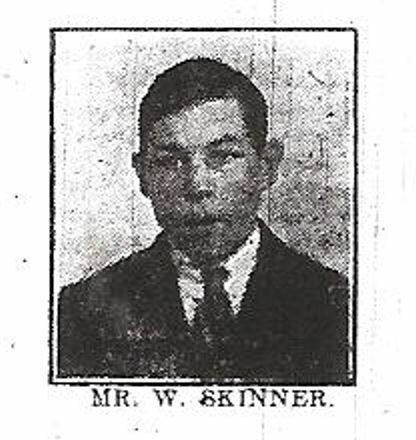 Walter Skinner – age 17, son of the landlord of the Red Lion, St James Street for whom he worked. The inquest opened in the then Town Hall, now the Maison Dieu, on the afternoon of Tuesday 21 August under the guidance of Sydenham Payn, the coroner. Present in the Court was Mayor Edwin Farley, General Bickford, Brigadier-General Massey-Lloyd, Cllr. Richard Barwick – Chairman of the Council’s Tram Committee, Reginald Knocker – Town Clerk and E Carden – the Tramways General Manager. The jury comprised of Foreman – James Wood, P E Wraight, A Cogger, J Hogben, J Graves, A White, G Bethal and E R Jezzard. The coroner told them that his first duty was to take evidence as to the identity of the victims. Thus, the jury had to first go to the Market Hall and then to the Military Hospital to view the bodies. This was followed by a visit to the scene of the accident. Coroner Payn set the tone of the proceedings by saying that some of the victims were men who had returned from the Front safely only to lose their lives in the accident. Sydenham Payn then thanked the organisations whom helped following the accident. These included Members of the Military, the Ambulance staff, town nurses from Dover Union (the workhouse), Dr Elliot, the Chief Constable and his officers, many of the residents of the district and Dr Fairlie Clark and the staff of the RVH. The Inquest was then adjourned until the following Monday and the jury left with the Coroner on their mission. On the following Monday the details of what had occurred prior to, at the time of and after the accident were examined. It quickly became clear that Bissenden had made a mistake by not switching the engine off and due to the lack of experience was unable to rectify the situation. Although the seating was for 48 passengers, it was evident that the tram was seriously overloaded, the number of passengers was given as 70. The Board of Trade Inquiry took place on Friday 28 August in the Town Hall, under Colonel Sir John Pringle, who had passed the route in 1905. Mayor Edwin Farley and Brigadier-General Massey-Lloyd accompanied him. E Carden, the Tramways General Manager, was the first witness and described the tram, saying that it had two 25.h.p. Motors fitted with ordinary hand brakes, electrical rheostat brakes and Spencer slipper track brakes that worked off a wheel. He and the remaining witnesses gave the history and details of the running of Dover’s tram system and their findings following the accident. The Inquiry concluded that Car No20 was not faulty but that Board of Trade recommendations should have been carried out. Car No20 was repaired and ran on the Buckland-Pier district service for several years after. The financial cost of the accident due to the inadequate insurance cover immediately led to an increase in the rates by 1shilling 6pence (7.5p) in the £. Paying back the borrowings to meet compensation claims was a burden on the ratepayers for a number of years after. On the declaration of War in 1914 the town had become ‘Fortress Dover’, under combined military and civilian ordinance. During that time, the economic stringency’s left massive repair bills following the withdrawal of the military in 1919 so money was tight. To compound this, countrywide there was an economic depression that was to last well over a decade. Hence, the philosophy of make do and mend applied throughout the tram system as to most other things. Thus, a tram, due to mechanical failure, careered down Crabble Road in September 1923. A passenger panicked, jumped off and was seriously injured. The tram stayed upright and momentum took it up the hill after crossing the river before slowly reversing and coming to a stop. The tram only had a few passengers on board as very little of the housing development envisaged along the tramway had been undertaken. The tramway manager had undertaken a feasibility study on the possibility of extending the line along the London Road to Kearsney and making a circular route by linking up with River tramway in Minnis Lane. However, it was estimated to cost £34,000 and was shelved. In 1929, East Kent Road Car Co. (EKRC), which had come into force in 1916 with the amalgamation of five bus companies, opened an office for charabanc bookings in Market Square. Their services took passengers to Deal, Folkestone and Canterbury and sometimes further afield. In 1934, the council discussed the possibility of replacing trams with trolley buses but this was narrowly defeated so the council negotiated with EKRC to lease petrol driven buses. In 1937, in return for a 21-year agreement giving EKRC a virtual monopoly in the town and the council receiving 75% of the net profits, buses replaced trams. Buckland Tramshed at the bottom of Crabble Hill. Mayor, Alderman George Norman, drove the last tram to Buckland tramshed, at the bottom of Crabble Hill, on 31 December 1936. People lined the streets to wave goodbye. Just before 23.30hrs that evening the last tram, Car No23, was driven by Vic Tutt onto the sleeper track at River then Joe Harman, the conductor – later a Dover historian, walked back to the Buckland tramshed. There he telephoned the Electricity Works to cut the electricity off for the last time to Dover’s tramway system. 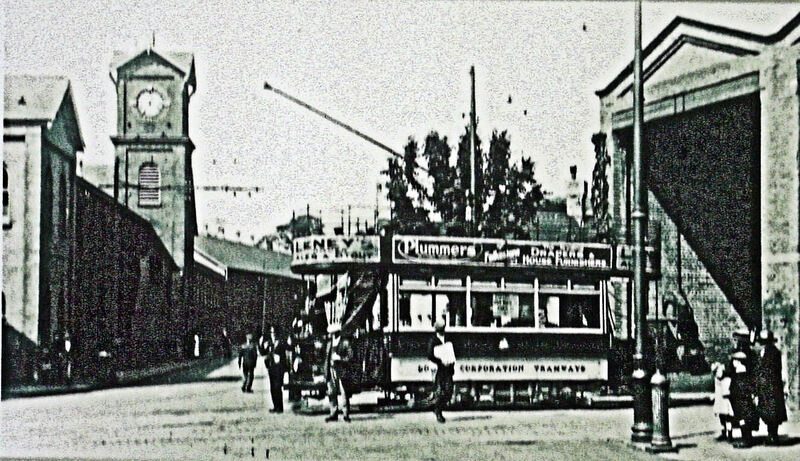 Local man, Albert James Bissenden, was the driver of the tram that fatal day and what happened haunted him for the rest of his life. He and his wife Mabel remained in Dover living at 25 Barton Road. Their eldest son, Colin was born on 16 April 1918, their daughter Eileen in 1920 and younger son Edward in 1923. At the time and thereafter no one ever expressed any recriminations over what happened. Eileen later said ‘which just goes to show what decent people live in Dover!’ Following that accident Bissenden trained as a carpenter and in 1930, the family moved to Acton then to Dagenham. Albert Bissenden died on 6 February 1953. 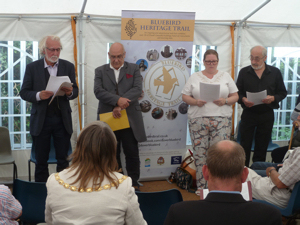 Presentation of the story of the Crabble Tram Accident by the Dover Tales from left to right Ray Newsam, Barry O’Brien, Stephanie Precious and Chris Precious. Watching, the Chairman of Dover District Council, Councillor Sue Chandler. A Sencicle. On Saturday 19 August 2017 the Dover Society presented a Centenary Memorial Exhibition honouring those who died, were injured or involved in the Crabble Tram Accident. 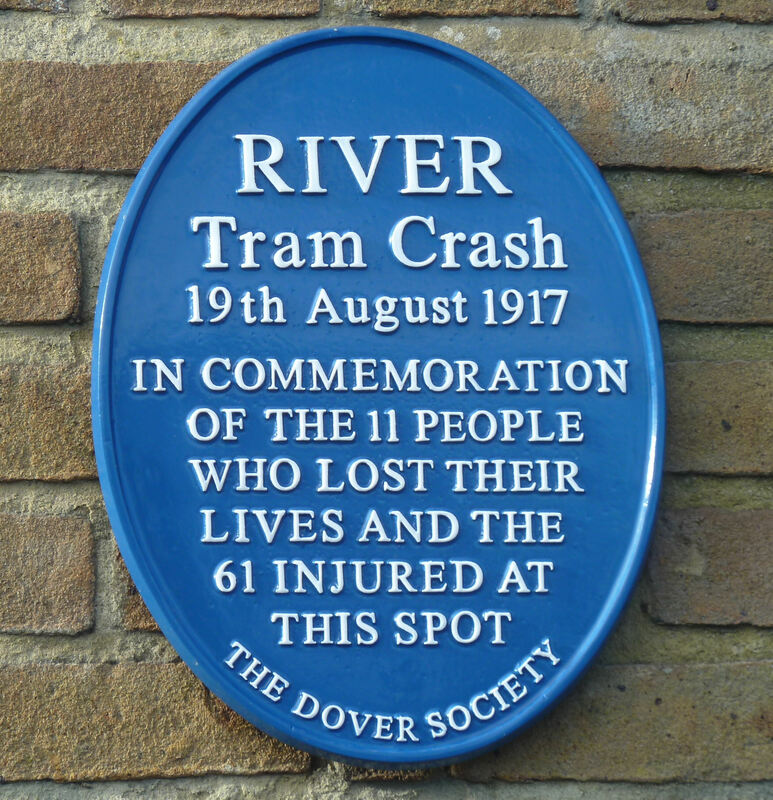 As recounted above, this took place on Crabble Road when the out of control tram hit the northern parapet of the River Dour Bridge – there is a Dover Society Plaque in commemoration of those that died or were injured. The Exhibition was held at Crabble Corn Mill and four members of the Dover Tales led by Barry O’Brien, supported by Ray Newsam and Stephanie and Chris Precious. They provided an excellent account of the tragedy that was accompanied by Paul Cheneour on the flute. In attendance was the Chairman of Dover District Council, Councillor Sue Chandler. Nine members of the Bissenden family came from all over England for the event and included Albert Bissenden’s grandsons David and Alan. Following the Exhibition presentation the family, accompanied by the Chairman of the Dover Society – Derek Leach and the author of the above article – Lorraine Sencicle, gathered at the place where the accident happened. 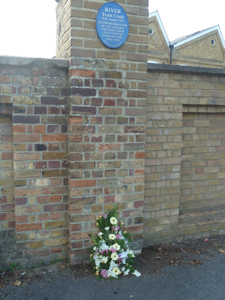 There, beneath the Dover Society plaque, after a short but moving speech given by David the two brothers laid a bouquet in Memory of those killed and injured that day 100 years ago. This entry was posted in Crabble Tram Accident - 19 August 1917, Crabble Tram Accident - 19 August 1917, Crabble Tram Accident - 19 August 1917, Crabble Tram Accident - 19 August 1917, River, Trams & Buses, World War I. Bookmark the permalink.